PAR38 LED Bulbs are very simple and easy to implement LED lights that will screw into traditional light sockets. 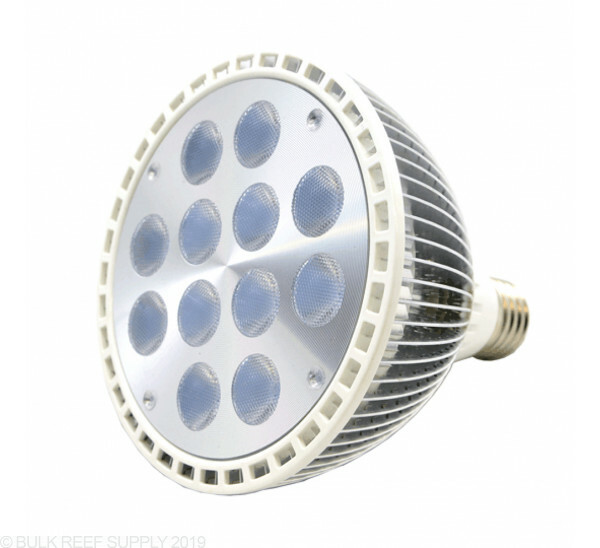 RapidLED produces their PAR38 bulbs with the latest Cree XT-E and XP-G LEDs using only 19 watts makes this light a great all around light for pico reef tanks with an overall spectrum of around 17,000K. If you have a nano or pico tank with a fairly small footprint the RapidLED PAR38 lights are perfect for your tank. 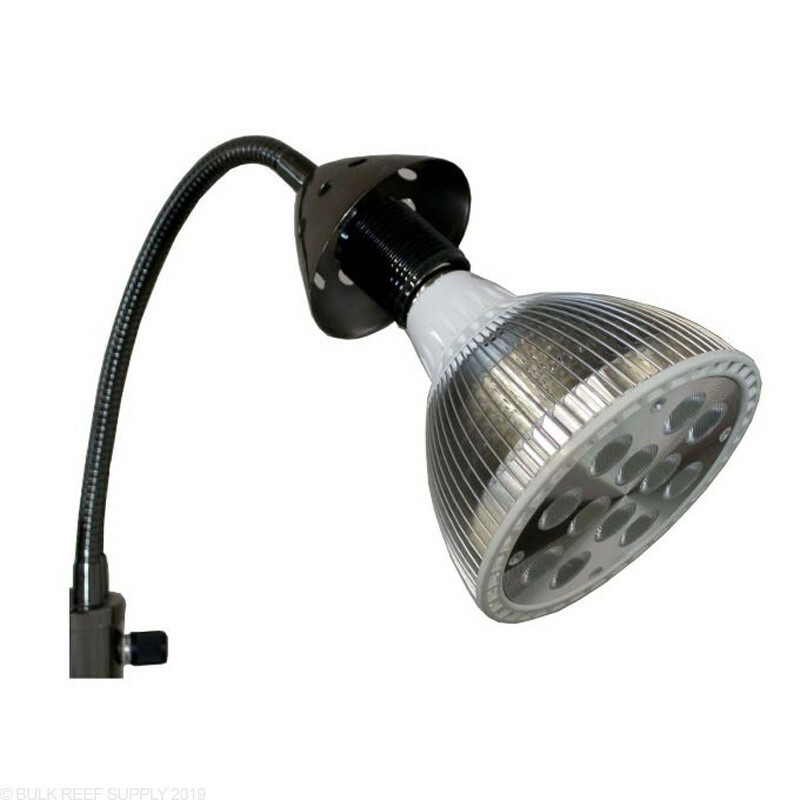 PAR38 lamps can either be the main light source or be an accent to a larger light. 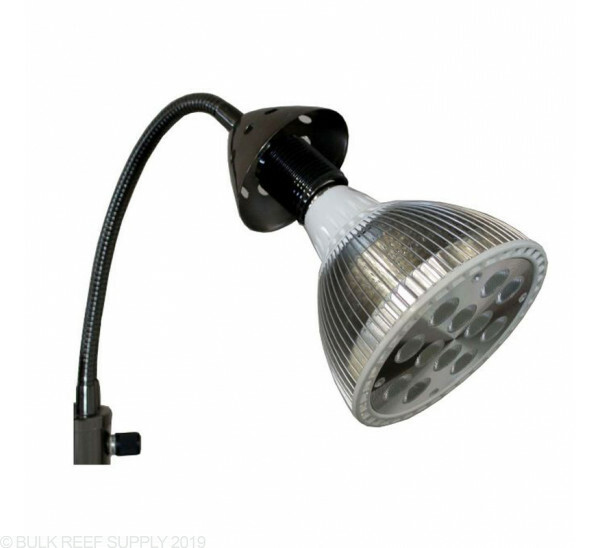 Daylight Reef PAR38 - Awesome daylight LED light for pico reef tanks. Emits a 17,000 K - 20,000 K spectrum which will allow your corals to grow fast and healthy with great coloration. Refugium PAR38 - Producing roughly 10,000 K spectrum that will efficiently grow macroalgae and other types of plants. This light can also be used on freshwater tanks. Note: We highly recommend using these lights in a well ventelated area for the maximum lifespan. I'm using this on a mixed 5L pico tank at about 50%. Corals love it. Got a Lowes lamp dimmer for this, and have flicker anywhere under 50%, not the light's fault. So I do wish BRS or Rapid would sell a gooseneck with a dimmer.. but alas... The light itself though does not get hot puts out a nice almost light lavender over all color. I'd get another one in a heartbeat. Bought two of these 8 months ago. Corals loved the lights and I was very happy with them until one died today. Not just one LED but the whole lamp simply clicked off. These are in an open air environment in an open fixture. There should be no over heating issues. A lot of money to have go so soon. I have very happy with this light. Nice color etc. I have it on a 20 high. There are not any sps in that tank. I plan to try one though. The dimmer I purchased is a Lutron credenza for cfl and led lights. from A big box store. It is pretty long like an extension cord and works well. No flicker. The light has an 80 degree angle. I will buy another. This was the perfect light for my 10g tank, super easy to install and use. Had an old light fixture from Target that I repurposed and just took the lamp shade off of. Wife thinks it looks great as well! Will a kessil a series mounting arm work on this? No, A kessil mounting arm is just a threaded mount for the kessil lights to mount to. The PAR bulbs fit into standard light bulb sockets. Feel free to let us know if you have any further questions! I am interested in using these in my large reef application. 46x46x24. How many would be appropriate for leather and lps? I'm afraid these fixtures may not be ideal for that application. While they are rated for about a 10-12" area of coverage, they have limited power and optics are not designed for deeper penetration. You would like need about 16 to cover that area, but light penetration would likely still not be sufficient at that depth. Does this light have the 60 or 80 degree lenses? This will come with 80 degree lenses. Feel free to let us know if you have any further questions! What is the actual watts emitting from this bulb? What is the min. high above the water line for this bulb? What is the nm on the 2 UV's? This bulb will run at 19 watts. Above the water line for best spread will be 6-7 inches. The nm rating of the UV LEDs is 400-410. Feel free to let us know if you have any further questions! Hi I purchased this light for a 5 gallon and it's like 8-10 inches deep and I have the light about ten inches above the top of the water. How high should it be. Will it grow sps coral? And the triac dimmer I can't figure out what it is and can't find a reputable website to buy from. Do I need a triac dimmer? Great question!Overl all you should mount the light high enough for even spread across the tank. This will be a little limited for a full SPS system however at higher levels int he water it certainly can work well! Any standard light socket outlet will work, the ones that come with dimmer switches instead of just on and off will have the triac built in. Feel free to let us know if you have any further questions! It appears as if the link was placed on the wrong product page. We will resolve this quickly. Currently there is not a manual for the PAR 38 bulbs, They are intended for use with standard light bulb sockets. Feel free to let us know if you have any further questions! What are the actual dimensions of the bulb? The diameter will be 4 5/8" and the height is 5". Feel free to let us know if you have any further questions!